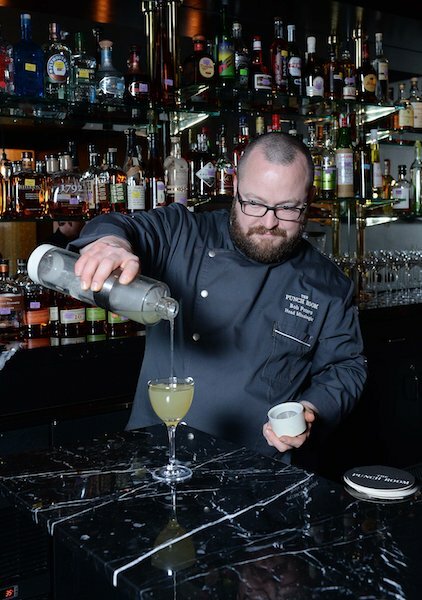 Here, on the 15th floor of the Ritz-Carlton, bartender Bob Peters’ concoctions sound like magical elixirs. A dash of exotic bitters here, a splash of infused syrup there, now carbonate this and smoke that. Watching Peters behind the bar feels like getting a glimpse of a mad scientist in his laboratory. This entry was posted in Press and tagged article, bars, bartender, best, Best bartender in Charlotte, Best cocktail bar, Best Cocktail bars in Charlotte, Best mixologist, Bob Peters, bob the bartender, bobthebartender, Charlotte, charlottefive, cocktail, Cocktails, james beard, mixologist, mixology, outstanding bar program, punch room, punch room ritz, the ritz, the ritz charlotte, The Ritz-Carlton.